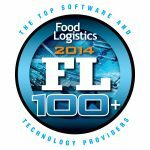 Hickory, NC (December 17, 2014) – Global third-party logistics (3PL) provider Transportation Insight has been selected by Food Logistics magazine for the second straight year for its annual FL100+ award of 100 top software and technology solution providers to the food and beverage industry. For more than a decade, the editors of Food Logistics have profiled software and technology providers that hold influential roles in the global food and beverage supply chain. Their products benefit the industry in multiple ways, from reducing food waste and extending shelf life, to facilitating safe and sanitary transportation of product while assuring regulatory compliance. Transportation Insight was selected based on its successful track record of providing food and beverage companies with state-of-the-art logistics technology applications that meet business objectives and drive value through clients’ supply chains. Transportation Insight provides an integrated suite of enterprise logistics solutions that incorporate freight bill audit and payment, transportation management, warehouse management technology, freight rate shopping, vendor routing, route optimization, mode optimization, load tendering, shipment tracking, Bill of Lading creation, ERP integration technology and interactive reporting and analytics. Each component is rooted in Transportation Insight’s Extended LEAN® continuous improvement methodology, which fosters long-term growth. As part of its blended technology solution, Transportation Insight’s industry-leading platform provides a transportation management system (TMS), deep analytical capabilities, extensive data warehousing, dynamic on-demand reporting, a Big Data solution and ease of customization and integration. Transportation Insight’s Insight TMS® supports cost reductions, streamlines shipment execution and improves visibility across an organization’s supply chain. “Working with reputable carriers who are dedicated to food safety best practices throughout their operations—from truck to warehouse to delivery—is key to mitigating food safety and quality risks through the point of use by consumers. Transportation Insight provides carrier sourcing services and helps companies select appropriate carriers with experience in the food and beverage industry,” adds Taylor. Transportation Insight is a global lead logistics provider with more than $1.8 billion in supply chain spend under management. For over a decade, the 3PL has partnered with hundreds of manufacturers, distributors and retailers to achieve significant cost savings, reduce cycle times and improve customer satisfaction rates by providing customized supply chain solutions. Transportation Insight offers a Co-managed Logistics® form of 3PL, carrier sourcing, freight bill audit and payment services, state-of-the-art transportation management system (TMS) applications and business intelligence. Its logistics services include domestic transportation, supply chain analytics, international transportation, warehouse sourcing, LEAN consulting and supply chain sourcing of indirect materials. Headquartered in Hickory, NC, Transportation Insight has secondary operating centers in Charlotte, NC, Bentonville, AR and Atlanta, GA, as well as more than 40 client support offices across North America. For more about Transportation Insight, visit www.transportationinsight.com.